In April 2018 four generations of descendants of Enoch Pearson Barratt gathered to celebrate the conservation of the former Government gardener’s headstone. 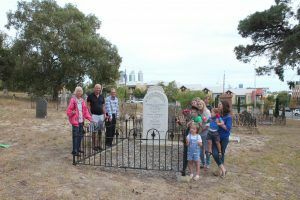 The conservation work was funded by donations to the East Perth Cemeteries Appeal from Ron Barratt, his sister Valerie, a former National Trust volunteer at the Cemeteries, and other descendants of Enoch. The donation allowed for a stonemason conservator to be contracted to repair the precious headstone and a National Trust staff to manage the works. The concrete slab needed to be removed, and it was carefully chipped away with hand tools. A thin layer of lime putty and crushed marble with a polished finish, known as ‘marmorino’ stucco, was applied to the back of the headstone to cover the damage from previous repairs. The headstone was gently cleaned and the concrete base supports to the cast iron fencing were treated, repaired and infilled with tinted cement. While the conservation work was happening Ron Barratt completed research into the history of Enoch Barratt. Ron provided some information on Enoch’s life achievements. Enoch Barratt, who arrived in the Swan River Colony as a convict in 1852, established its first commercial nursery. In 1861 he was paid 16 shillings by the city council for street trees for St Georges Terrace, the start of his horticultural career. Soon after that, he took up land in Wellington Street and established the Wellington Nursery. He was also appointed Government Gardener, looking after Stirling and Queens Gardens. Enoch’s son James joined the family business and his grandson Edward carried the nursery into a third generation. The business expanded and thrived until the land was sold in 1904 to make way for the railway and associated transport businesses. The headstone records that James’s wife Frances died in 1891 and Enoch’s wife Mary Ann died in 1877. Enoch was the last name added to the headstone in 1895. He died in 1895 at the age of 83. Descendants of Enoch Barratt gathered to celebrate the restored headstone.